Take your graduation celebration to the next level (or grade!) with an impressive Mortarboard Cake. 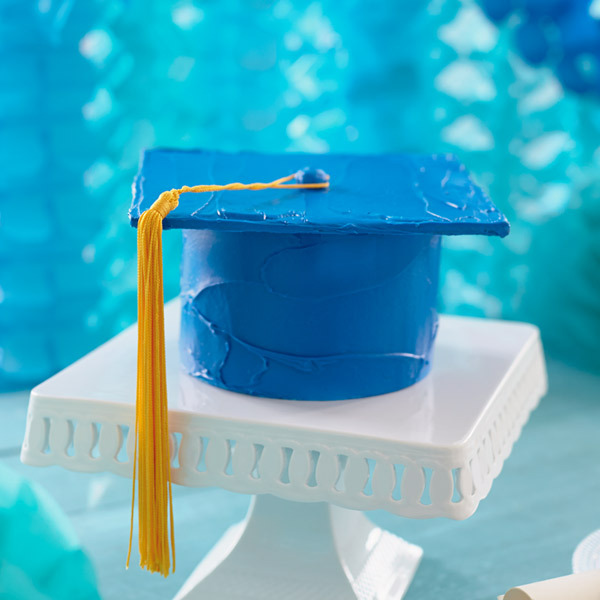 This graduation party dessert recipe incorporates store-bought cake mix and a tassel cake topper, so you won't have to stay up all night to get a top-notch dessert and table centerpiece. With our instructions and Royal Icing recipe, you don't have to be a graduate-level baker to create this yummy graduation dessert. Bake your cake according to box instructions using the 2, 6-inch round cake pans. Use muffin tins to bake any leftover batter (optional). Make Bernard's Royal Icing, and cover with damp cloth until needed. Add food coloring to both canned frosting and royal icing (matching colors). Assemble cake layers and frost the outside of the cake with the colored canned frosting, as evenly as possible. Evenly frost the bottom of the cardboard square with the colored royal icing. Place cardboard on waxed paper to let icing harden for about an hour. Keep your remaining royal icing covered until you’re ready to use it again. Then frost the top and sides of the cardboard with more colored royal icing. Let harden. Place cardboard on center of frosted 6-inch layer cake. Add candy “button” to center of cardboard by securing it with a dot of royal icing. When button is set, loop end of tassel over the button.